Mayday! Mayday! Someone's using my tablet! Apple names its software updates by numbered versions, like iOS 7. Android, meanwhile, takes on the identity of popular sugary treats, like Android KitKat. Amazon, meanwhile, has its head in the bottle,naming the new operating system for its new Kindle Fire HD tablets "Mojito". Like previous versions of the Fire OS, Mojito is based on an Android base - Jelly Bean this time around - with Amazon then adding an all new user interface and custom features to the tablets. Also like previous versions, there's no way to access the Google Play store from the Kindle Fire HD or Kindle Fire HDX, with Amazon instead pushing its own app store on Fire users. That said, Amazon claims that most Android apps will work natively on the new OS. While the Ui will be immediately familiar for any current Kindle Fire HD owner, there have been a few subtle improvements in the latest release. Amazon services have been deeply integrated directly into the platform, with new additions adding all new functionalities to the device. One of the biggest new features is Mayday, a dedicated button built into the quick settings button on the HDX which aims to deliver on-device tech support within 15 seconds of being pressed, every day of the year. Other Amazon technologies are also getting some time in the Fire OS spotlight. Goodreads, the ability to share your reading experience with friends, will be further integrated into the OS care of a free over the air update in November. The same update will also bring second screen content sharing to your TV, the ability to archive unnecessary content to the cloud with one tap, and deeper enterprise support. Also interesting is the expansion of Amazon's X-ray feature to music, allowing users to download song lyrics and sing along. The service continues to be offered for TV shows and movies, which provides relevant information about the program on your TV based on the audio. Amazon is one of the biggest names in the cloud business, so it's no surprise the new operating system takes advantage of that. Amazon will let you organise all your collections, from books and apps to TV shows and movies, with all content stored in the cloud, and synced across Amazon devices using Whispersync with the November update. There's also been moves into family friendly content through Kindle Freetime, which gives parents the ability to whitelist content for their kids consumption. There's no official word on whether the Mojito build of the Fire OS will be rolled out to older Amazon tablets, although it seems likely given Amazon's previous track record with software updates. Software is nice, but hardware is where the real excitement is. 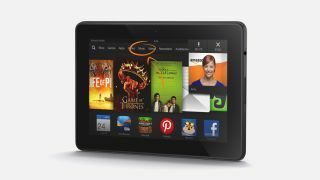 Check out the new Kindle Fire HD here.